After enduring a torturous first day of class — including on-the-spot lab cancellations and two hours of awkward introductions — most of us likely wish that we could relive the relative peace and freedom of last week. Though most of us may have been lounging about away from Berkeley, many others — namely spring admits — were partying it up with all the Welcome Week goings-on. In case your flight was delayed by a matter of days, allow us to catch you up on everything that went down. In the event that you’ve made use of a dorm restroom and taken a number two anytime last semester, you’ve probably seen one of the health tips that our awesome health workers have been putting together. Their peers at the Tang Center put on a presentation about staying healthy, something that a lot of us have yet to learn. In the effort to promote wellness, there was also a successful blood drive held by the volunteers for Red Cross. If you missed out on this or feel like you have some extra blood in your body, you can always drop by the Oakland Donor Center to help out someone in need. 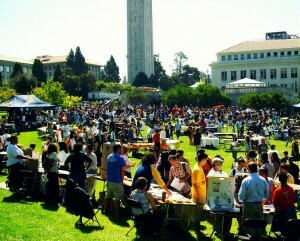 One of the things that Cal is most renowned for is the myriad resources that the campus offers. After all, it’s only an advantage if you make use of it, so it was only fitting that a bunch of the newly enrolled students came out for the resource fair. And getting to sample some of the restaurants from the area was probably a good incentive too. We doubt that anyone truly felt like a Golden Bear until he or she attended their first rally. The Cal Band gave its first electrifying performance of the semester, as did the Cal Dance Team. If the energy wasn’t high enough at that point, the spring admits got their own discount at the student store — which is an even bigger deal if you’ve seen the lines in the past couple of days. To cap off the festivities, there was the student-favorite spring edition of Calapalooza, where the students flocked to as many tables as they could to sign up for their favorite clubs and activities. After all the understandably strenuous walking throughout the week, there was finally a chance to settle in for concerts and a cappella performances! We all have fond, or perhaps hazy, memories of our first Welcome Week and now another generation of Cal students joins our ranks. Though we may groan and complain about the difficulty of life as the semester wears on, we can always look back and recognize that it always starts out pretty well.